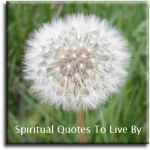 These spiritual law of attraction quotes are all uplifting words about the universal law that teaches us that like attracts like. They are all channelled messages which are great sources of wisdom on understanding the law of attraction to enable us to live an abundant life of Love, Joy and Beauty. 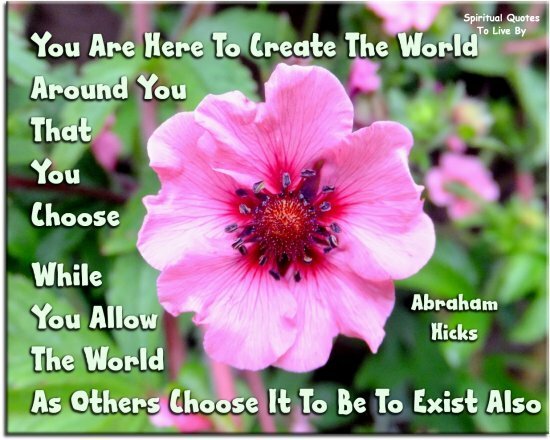 With the assistance of her husband Jerry, Esther Hicks has brought messages through from Abraham since the 1980's. Abraham describe themselves as 'a collective consciousness.' Jerry moved on to the Non-Physical in 2011, so now assists from the other dimension. I am the releaser of my own vibrational butterflies. And law of attraction is the master facilitator to match up those frequencies and to deliver to me manifestational evidence, for one purpose and one purpose only… To help me in the deliberateness of my creative endeavour. In 1973 Darryl had two close-range encounters with UFO's which led him to research the paranormal. In the early 80's he started to study channelling and became attuned to an enlightened extraterrestrial being from what we perceive as the future named Bashar. Darryl has been channelling Bashar publicly since 1983. 4. Change is the only constant.. Except for the first three laws. Stop paying or buying into the ideas that don’t resonate with the reality you prefer. Stop giving them credence. Appreciate.. 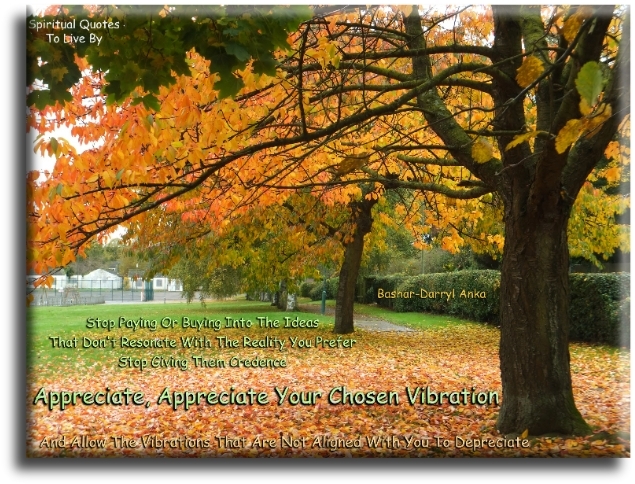 Appreciate your chosen vibration and allow the vibrations that are not aligned with you to de-preciate. The energy you give off - based on your beliefs, your emotions, your behaviour - the vibrational frequency you give off is what determines the kind of reality experience you have, because physical reality doesn't exist except as a reflection of what you most strongly believe is true for you. That is all that physical reality is. It is literally like a mirror. When you change your vibration by changing the way you think, by changing the way you act - you change your frequency - you go faster, things run more smoothly, not quite so slowly and difficult. If you are moving too s-l-o-w-l-y, if you are too solid (because your beliefs and your ideas say that things have to be hard) things have to be difficult, to the point where you hardly know how to move at all. You can learn new ideas, ideas that have higher energy to them. 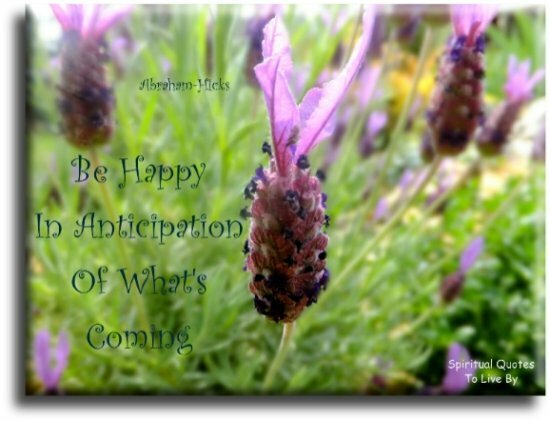 When you learn how to see things in new ways and they bring higher energy, then things are easy - the Universe moves easily, you can change things quickly, you can create things in your life, attract things in your life... quickly, smoothly. You were granted this ability. You are an unlimited aspect, a portion of God, of the Creator, or All That Is. You can learn new ideas, ideas that have higher energy to them. 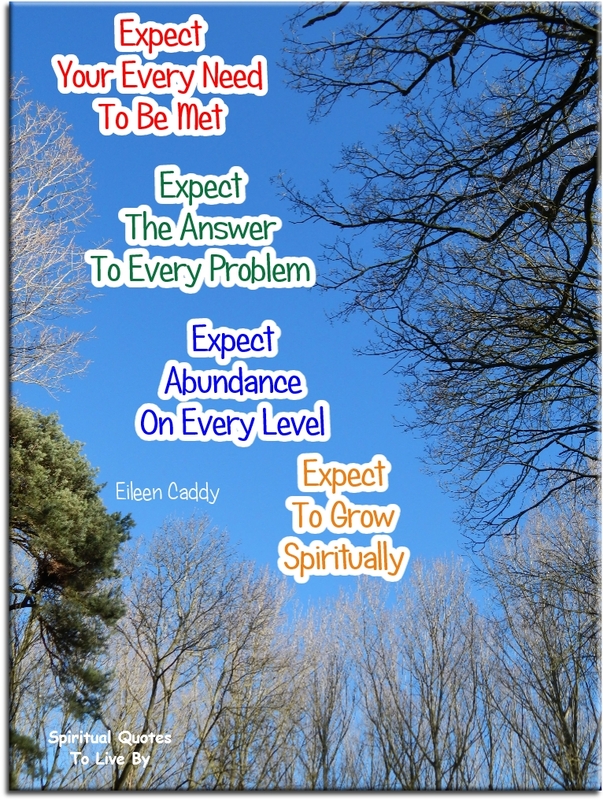 When you learn how to see things in new ways and they bring higher energy, then things are easy - the Universe moves easily, you can change things quickly, you can create things in your life, attract things in your life… quickly, smoothly. Your belief in yourselves is the only thing that will make a difference and create an ability for you to see for yourselves that you really are unlimited beings, in the way that you were fashioned to be. Blossom Goodchild has voice channelled a Native American called White Cloud since 1999. In 2005 she began communicating with The Federation Of Light and has continued to regularly bring their loving messages through even though at times it has caused her difficulties. 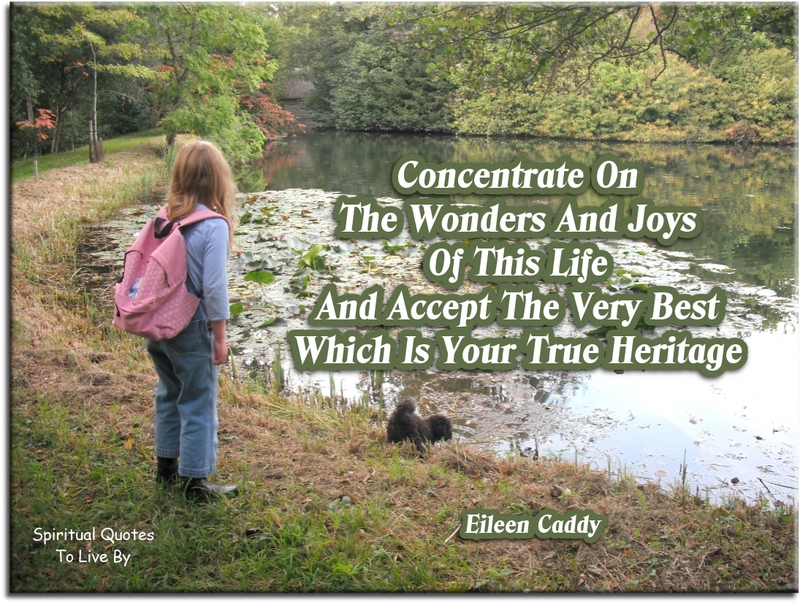 Eileen Caddy began to hear the voice of God while meditating when she visited a sanctuary in Glastonbury, UK in the 1950's. 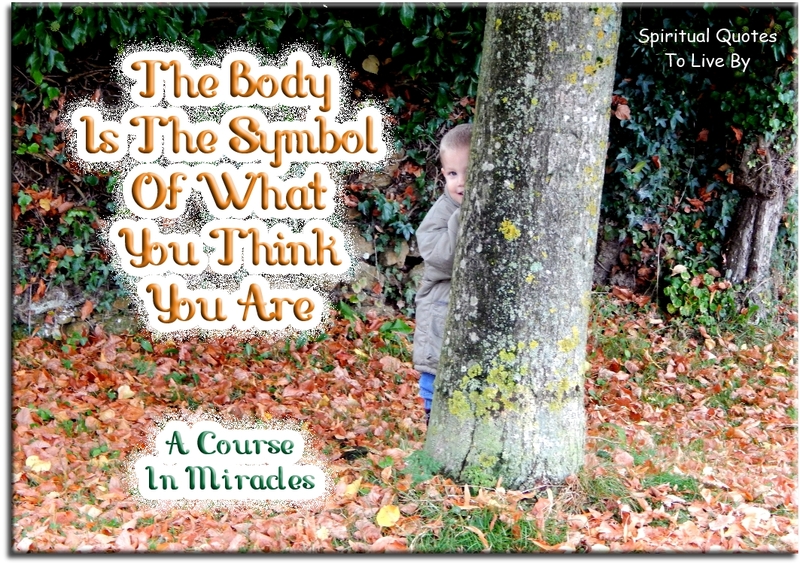 She became one of the founders of a New Age Spiritual Community near the village of Findhorn in Scotland and over the years wrote many books dictated from her inner guidance that she taught is within us all. Be very very still and allow every new experience to take place in your life without any resistance whatsoever. You do not have to do anything, you simply have to be and let things happen. Stride forward with a firm steady step, knowing with a deep certain inner knowing, that you will reach every goal you set yourselves, that you will achieve every aim. Neale Donald Walsch began a Conversation With God in 1992 when writing an angry letter asking why his life was all going wrong, an answer flowed through him which went on to become a series of books. If there is some aspect of creation you find you do not enjoy, bless it and simply change it. Choose again... Call forth a new reality. Think a new thought. Say a new word. Do a new thing. It is not God’s function to create or uncreate, the circumstances or conditions in your life. 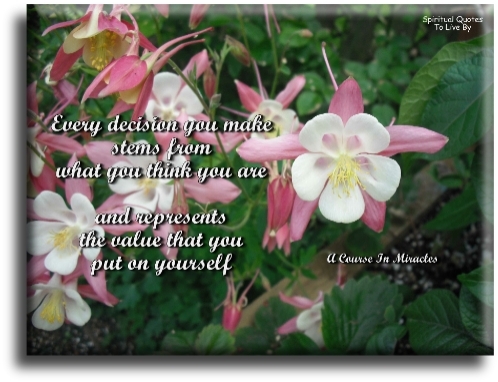 God created you, in the image and likeness of God. You have created the rest, through the power that God has given you. You are always and forever in the moment of pure creation. So create who and what you are, and then experience that. You are always in the process of creation. Every moment, every minute, every day. 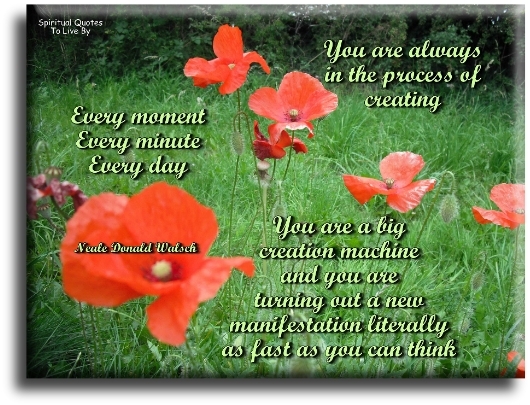 You are a big creation machine and you are turning out a new manifestation literally as fast as you can think. The correct prayer is therefore never a prayer of supplication, but a prayer of gratitude. When you thank God in advance for that which you choose to experience in your reality, you in effect, acknowledge that it is there… in effect. Thankfulness is thus the most powerful statement to God - an affirmation that even before you ask, I have answered. Therefore never supplicate.. Appreciate. 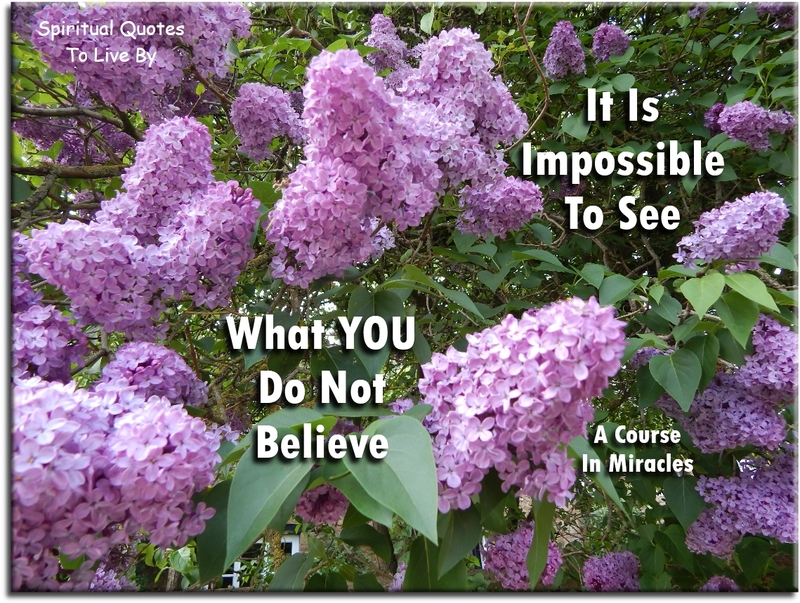 A Course In Miracles is a book that took Helen Schucman seven years to write, it was given to her from a voice that she heard who identified himself as Jesus. Helen was an agnostic and never claimed authorship for the book, which was published in 1976 and became a worldwide phenomenon. Remember that no one is where he is by accident and chance plays no part in God’s plan. Truth is always abundant. Those who perceive and acknowledge that they have everything have no needs of any kind. When you meet anyone, remember it is a Holy encounter. As you see him you will see yourself. As you treat him you will treat yourself. As you think of him you will think of yourself. Never forget this, for in him you will find yourself or lose yourself. Whenever you are afraid it is a sure sign that you have allowed your mind to miscreate, and have not allowed Me to guide it. You are not the victim of the world you see because you invented it. You can give it up as easily as you made it up. Mike Quinsey began sitting at his computer and receiving messages every day in 2004. Three times a week he receives messages from SaLuSa a space being from Sirius and a member of the Galactic Federation. As the days are passing, you are becoming more powerful and have much stronger powers of creation, use them wisely for the good of All. Dear Ones, we do not want to make your tasks sound too difficult, as they are helped considerably by the incoming energies being beamed to Earth. As you attract then to yourself, so your vibrations lift up. Remember that all of the time you are creating your own reality, and you are now benefiting from the dedication of the Lightworkers that have gradually guided Humanity towards the Light. The demand for peace is uppermost in so many peoples minds, and that powerful energy is instrumental in bringing it into being. As we see your Earth it becomes apparent that the Light Grids are exceptionally strong now and lifting Earth up into the higher vibrations, as like attracts like. The process of Ascension marches onwards and the dark ones can no longer hold it back. The measure of a Souls worth is by the degree to which that Soul can share its love. Love is the motivation behind all acts of kindness asking nothing in return. Yet whatever one gives out is returned through the Law of Attraction. At a time when the needs of others are mounting, the presence of those of the Light is a blessing, and those who wish to serve will find plenty of opportunity. Those of the Light are drawing away from those who are not. It is the Law of Attraction at work and it is a quite natural response, and is why even now you gravitate to people with a similar outlook. There are no limitations to the self... except those you believe. You are given the gift of God, you create your reality according to your beliefs. Yours is the creative energy that makes your world. You get what you concentrate upon... there is no other main rule.